Simply put, the hazard reporting process is the primary mode of data acquisition in aviation safety management systems (SMS). Being such, a poor hazard reporting process can literally break your SMS. If that sounds unrealistic, it’s not. You will have no benchmarks to monitor SMS performance or demonstrate continuous improvement of the SMS. Main catalyst for driving creation of new risk controls. Assures accountable executives their SMS is performing. Clear expectations about what happens with hazard reports (i.e., ability to track report progress). Quality hazard reporting forms will capture enough information so that the safety manager doesn’t need to request more information, but not so much information that filling out the form is very tedious. You can see in the above bullet points that the major themes in quality hazard reporting process are that the process is quick, convenient, and thorough. The primary goal when developing your hazard reporting process is to stimulate hazard reporting culture. When aviation service providers have good safety cultures, their hazard reporting activity will naturally indicate this. A good rule of thumb for healthy safety cultures is to have one safety report for every ten employees each month. For example, if your company has 400 employees, then you should expect 40 safety reports each month. Are you looking for a nice safety promotion poster to positively influence your hazard reporting culture? As you can see, it’s very straightforward and easy. Doing all of this on a guided, digital format makes this process much faster, easier, and helps avoid errors. The reason number nine is included above is because it encourages future hazard reporting and allows for employees to "self-close" the feedback process. Allowing employees to follow up on their reported safety concerns improves safety cultures. There is nothing more frustrating than "not knowing" what actions management is doing to mitigate risk after you have taken the time to report the safety concern. If your SMS is not reciprocating to your hazard identifiers and hazard reporters, then your chances of benefiting from future proactive risk management processes diminishes quickly. Short story is: give prompt and regular feedback to employees submitting safety issues. Management's behaviors and follow-up actions during routine reactive risk management processes sets the stage for more advanced risk management processes you are hoping to participate in the future, namely proactive and predictive risk management. Mobile friendly forms that respond to reporter's device (smart phone, laptop, etc.). Long story short, if you hazard reporting forms are cluttered, unclear, tedious, or poor-looking, then employees have every incentive NOT to report safety concerns. 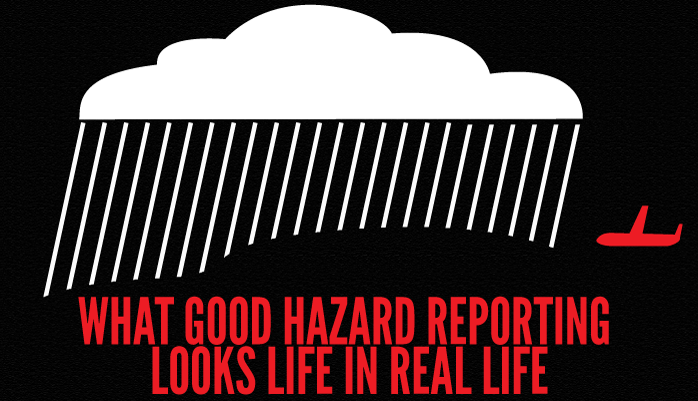 Good hazard reporting forms give employees incentive to report issues. The worst reporting forms I've ever seen come from civil aviation authorities. They are brutal to look at and my stomach turns when I consider filling out such lengthy forms. If you want an example of NOT what to do, look at your CAA's reporting forms. Do you think EASA's reporting form is the worst? Do you have an example of a very bad reporting form? Include a link to it in the comments. Train employees on hazard identification. Ready for a live demo to answer your questions? Published October 2017. Last updated January 2019.